Many of us in the Early Financial Independence, Early Retirement, community are chasing an amount of wealth which when achieved will allow us to as a minimum call ourselves financially independent and as a maximum allow us to head into full early retirement. To calculate that target wealth number it’s likely (I know I have) we've ascertained how much we intend to spend per annum and then divided that number by a Safe Withdrawal Rate (SWR) we’re happy with. The 4% Rule is a SWR that is bandied about freely as a rule of thumb. Personally it’s too bullish for me and so as I type this I'm planning on an SWR of 2.5% plus 0.25% to allow for investment expenses for a total withdrawal rate of 2.75%. When we choose a SWR we’re likely trying to calculate the maximum real inflation adjusted annual income we can take while ensuring we don’t run out of wealth before we run out of life. In doing so what we are really doing is trying to protect ourselves from worst case sequence of returns risk. In trying to protect ourselves from this sequence of returns risk (and assuming history repeats which we all know is not guaranteed) we actually end up with a scenario where in the vast majority of cases we end up with a lot more wealth than we started with at check out time. It shows that if history repeats I have a 100% chance of success with the lowest ending portfolio value being $883,006 in today’s dollars. If I was US based this is great because in my case I don’t have an inheritance to fall back on, won’t receive any defined benefit pension and am assuming that by the time I get to State Pension Age there will be none for me so a high probability of success is important. The kicker is that while it’s great it’s also conservative in most cases. For example the median ending portfolio value in this example is 2.3 times more than I started with at $2,374,655 and in the extreme it’s more than 10 times starting value at $10,568,367. So why is this important? Well it’s great to be conservative but I'm also conscious that this conservatism is going to force me to work longer than I have to in most instances which then needs to be weighed up against the fact that I'm going to be a long time dead. I’m not sure what if anything I can or will do with this but it’s worth at least thinking about and investigating further. Have you selected a SWR? If yes what percentage have you chosen? This is extremely interesting. I think it is what I was groping for in my comment on your post of 7th March. In your situation it would definitely make me think about using a decision tool based (in the case of shares) on earnings or dividends rather than gross stock market valuations. This would not be perfect but, in the absence of a tool like this based on UK data, it would probably be a move in the direction suggested by the clip because these streams of income tend to be less volatile than capital valuations. (For example it would mean retiring only when dividend income exceeds £X by a safe margin rather than when market valuation exceeds £Y.) Thanks very much for putting this on. I sort of see what you are getting at re divi's but I think it's much more complicated than that because it's not just a valuation problem but also a time problem (the sequence of returns). For example with all else being equal the punter who has his stock market halve in value for 2 years is in far more trouble than the one who sees it halve for 1 year because they're both continually drawing income. I freely admit I don't have an answer to this one. Of course maybe there isn't an answer. I hope other readers soon jump in as it's certainly a very important topic. There'll be selection bias toward retiring at a point which leads to the worst case scenario being more probable. The best case scenarios probably start in the wake of severe market drop which would put plans on hold. I agree that this is something I and others could very much be walking into. Thus my current "conservative" approach of a 2.5% (2.75% inc expenses) SWR. The problem is you probably only start to understand if you have a problem 5 to 10 years into retirement by which time it could be all too late. You've lost your employment edge and you can't cut back expenses far enough to make a difference. As I understand it, the 4% SWR was based on a US model of 50:50 equities/bonds. I know that over different periods, returns on these assets have varied across different global regions. It would be interesting to apply the outcome using e.g. UK model. It seems to me a lot depends upon the weight of equities selected at the time the income is required which in turn, I suppose, reflects the degree of volatility to capital desired which may be different for each individual. For myself, I feel comfortable with around 60% equities - 40% fixed interest (but no gilts at present time). Once a suitable buffer is accumulated - say 12m income reserve for example, I then withdraw the natural income generated. As the larger part is equity, the total income should rise each year to keep pace with inflation. Personally, I would think 2.5%/2.75% is very low if using as a guide to assess what capital sum is enough - maybe a more realistic figure could be 3.5% but again, this will all depend on the final asset allocation. Finally, I know you discount it but I really cannot see state pensions disappearing in the next 30 - 40 yrs, so maybe the icing on the cake?! Full details on the 4% Rule are detailed in the 2nd hyperlink of the post. Yes it was US based. The study included 5 different allocations ranging from 100% equity to 100% bonds but the rule of thumb was as you say based on 50:50. Wade Pfau has run a study based on many countries including the UK. You can access it via the 3rd hyperlink. For 50% UK Equities and 50% UK Bonds he found 3.05% was the maximum you could withdraw over 30 years to not run out. For 50% Global Equities and 50% Global Bonds that rose slightly to 3.26%. It's actually where I estimated my 2.5%/2.75% SWR from. I'll need the money for more than 30 years but like you will end up with a slightly higher equity allocation at around 60% which if history repeats should do slightly better than a 50:50 portfolio. I'll also be watching like a hawk in the early days so hopefully will spot poor sequence of returns and still be young enough to do something about it. Agree re State Pension. I'm not going to plan around a government handout as disappointment is probably guaranteed. If I get anything it will be as you say icing on the cake. As you say, start off with the 2.5% and see how it goes. Even when you have moved on from working flat out for the Man, I suspect you may well move into more pleasurable ways to pass the days, some of which may generate income so it won't be as if there is no other income streams - even if it may be useful to think like that at present. Be interested to see how it all pans out. Hi John, I suspect you may well be right. I'm also very interested in how this experiment is going to pan out. Cheers, RIT. It's a pity nobody has ever invented a financial device by which you exchange a lump of capital for a lifetime income. You underestimate how developed financial instruments are. This is a simple instrument ( well, almost) which exists now. It could be structured as puttable bond, with put option exercised by the estate when the holder of the bond dies. I don't know if annuity with this feature is really offered, but nothing prevents such an offer if there is a demand, and if approached, insurance companies may offer such a product. Someone from large financial organization can tell you as they would now terms of various inter-institutional contracts. Or you can pull some info from brokers. If we fix your life expectancy to 100, then one can use long term swap rates ( no sure how liquid 56 year swaps are) to derive it. Here are SONIA OIS swap rates for up to 5 years. I suspect you have far more knowledge than me on swap rates. I'll be 44 by the time I'm financially independent and let's assume I live to 90 so only 46 more years on this great planet. Let's also assume that inflation averages 3% over that period. What's my 'income' in real % terms per annum? I'm guessing well less than 2.5%. Unfortunately, I cannot tell you. At least I would need access to Market Data, which I dont have and even if I had had, I would not have been able to reveal in public forum without violation of certain terms. What you are asking is to model a bespoke instrument for you, which you would like to purchase with certain parameters. The specialist would calibrate the model and calculate its risk (Value at Risk) for the interest above inflation you would like to receive. I suspect with either Monte-Carlo or historical simulations. But I doubt such a service will be offered to a retail client unless one is High-net-worth individual. So, let us continue guessing..
Oh, all right, let's reinvent tontines then. Ok, here is how it is actually done. Then using various option prices to find parameters of the model, CDS prices for survival probabilities, some statistics for death age distribution, etc. 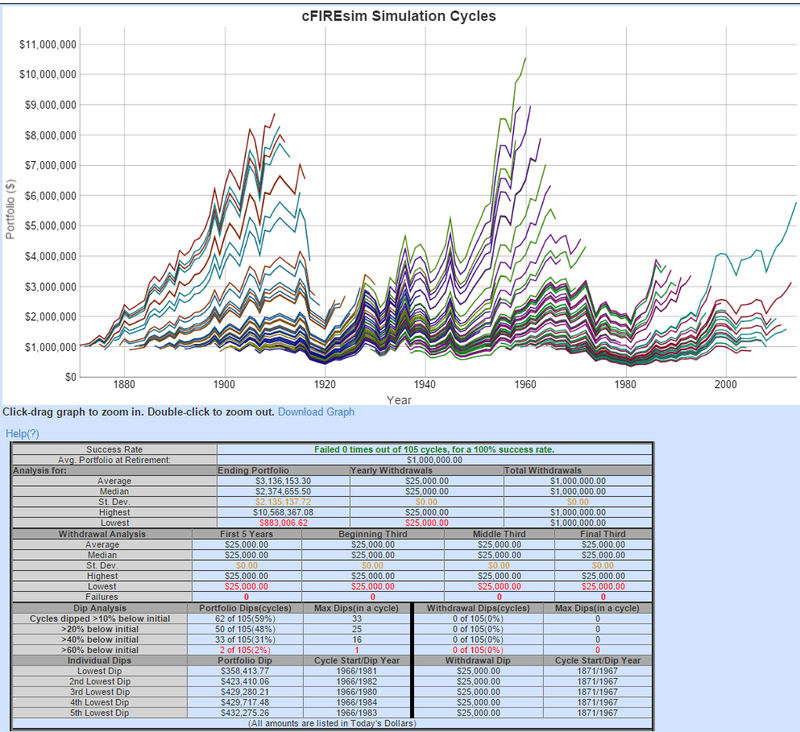 Now running Monte-Carlo with models and parameters for a sample withdrawal rate. Checking the mean of many calculation. Adjusting the rate and re-running it again. You will get your answer based on current market information. Yes, and most use SABR model for equity and interest rates. It seems to me the video is mostly about how to survive a bear market. What I would do is this: start with the 4% rule, but try to avoid having to sell shares with a loss during a bear market by having a bucket of cash that makes up for the difference between interest and dividends you receive and shares you would need to sell to get to your remaining yearly income need for a period of let's say 5 years. I guess the longer you are in your retirement period, the larger this cash bucket must be because of the increased withdrawal %, but than the older you get, it's probably not a bad idea to go to like a 40/60 shares/fixed income portfolio. This will not solve the problem of a long bear market, but hopefully can soften the blow. Than there is the issue of how to prevent dying rich: if returns are consistently higher than modelled for, start giving yourself a yearly raise of double the inflation %. When a bear market comes at some point, skip a couple of years inflation adjustment. Obviously there are no guarantees, but this is how I probably would try to deal with the volatility. Thanks for sharing your thoughts. I'm conscious that cash will likely earn a negative return after inflation and tax so don't want to hold to much as it will damage return but I'll certainly be holding some for the reason you suggest. Initially this will be a lot as it will be the home purchase but whether it will be more or less than 5 years worth post home purchase will certainly need careful consideration. I'm currently holding 9.6% of total wealth in cash and need to be increasing that a lot over the next 18 months so I'm definitely not adverse to cash. The SWR is an interesting subject and one that will get more attention following the new updates here in the UK (I hope!). At the moment I have been looking at a 4% rate with the assumption the split would be 75% equity / 25% bonds and cash. I'd want enough in cash and bonds to be able to sustain me through a depressed market (say 5 years). I'm hoping 4% wouldn't be too aggressive as I don't aim to stop working completely and have tried to aim for a withdrawal amount that I could easily cut back on. (I suppose that's just a different way of bringing in some prudence). Thanks for sharing Mr Z. I've decided that 4% is too rich for me but I'm trying to give myself the option of full early retirement (the option of never having to work again if I don't want to). It sounds like you're in a very different situation to me with work and cut-back options but is that really FI? I think we have to each answer that question for ourselves but FI for me is that work becomes truly optional so we are likely under different definitions here. The cut-back bit is probably within both our FI definitions but my problem is that I already run pretty lean here so don't have too many options. Out of interest have you read the third link in the post which provides details and links to the Pfau study which included some UK elements? It assumes 50:50 where you are 75:25 but if you were a UK investor with UK equities/bonds then in any 30 year period you ran out of money 23.8% of the time! If you had 'global' equities/bonds then you only fared slightly better running out 17.9% of the time. Pretty sobering stuff. I didn't explain very well. I would still work, but not in my current office job. It would be out of interest rather than specifically for the money. Who knows, I quite fancy learning carpentry or being a motorbike mechanic...and if it's not enjoyable I can just move on. I did read some of the Pfau study, and I may have another read. I did read something else about an updated study that concluded that the allocation between stocks and equities (Between 30% and 80% from memory) had little impact of the probability of ruin. If I can find it again, I will forward you the link. Thanks for sharing that video. Very interesting. Spelled out like that, it intuitively seems a much better method than just picking a % without taking valuation into account. I watched that whole video, and it is fascinating. Having said that how do we define where we are right now in relation to the green line? Pay them the money and they might tell you for USA. The video is an advertisement. If the Internal Rate Of Return / Value Gap method is so completely predictable & reliable, then what is the point of a 50/50, 60/40 or any other mix of poorer performing bonds with the equity portion of your portfolio. Now that we have a theory to make the market volatility evaporate (at least in terms of calculating a safe withdrawal rate) then what is to stop anyone going for a higher return 100% equity portfolio? Secondly, as per conversation I remember in the comments section of a previous post around here, there is a psychological problem with drawing down on capital, whereas drawing the income only is easier to do. Therefore if you have a 100% equity portfolio and ignore the current market value (which anyway Buffet tells us is nothing more than the outcome of a voting machine) then you have to base your withdrawal rate on the portfolio dividend flow (I avoid using the word yield as this is would be a measurement relative to the current market value). If you were to accept this, then you also have a way to solve the 30 years vs. 50 years problem for early FI, where the pot as to last not 30 but 50 years or so. The outcome of these thought processes for me is this: go for a 100% equity portfolio and draw down 90% (change this figure to your own preference) of your dividends, and reinvest the remaining 10% of dividends. The portfolio earnings growth is your hedge against inflation, and the 10% of dividends reinvested is your margin of safety (which can be cut in the future if your portfolio income grows too high). I'm sure this is flawed somewhere, so I look forward to someone helping me out by telling me how & why it is flawed! I find the 4% rule pretty conservative, it's based upon a worst case scenario. I made a simple spreadsheet model myself, for a conservative low growth-deflationary scenario (as this seems to be the most likely future) with 4% real average return for a 50/50 portfolio. Starting with 4% withdrawals, adjusted for inflation, I was surprised to see how much money was left over after 30 years. What disasters need to happen if you would have to run out of money within 30 years? Obviously starting at the top of the market with a terrible bear market awaiting can change the outcome compared to the average return I used in my simple model, but how likely is this? Or am I missing something? What I did not take into account in my model is taxes, but than I am planning to retire in a tax friendly country.